If you are not familiar with our upcoming home release, read about it here. Added keyboard accessibility for drag-and-drop menus; these were left over from the previously released accessibility fixes. Only users who have a current NSF Biosketch in place will notice this NSF Biosketch update. The work is nearly finished on the updated versions of the NIH Biosketch and AACSB report. We expect to have them available to you soon. We have added an updated version of the NSF Biosketch template within Faculty180. It will be available to institutions for use, in addition to past versions. If you have any questions, please reach out to your Interfolio project manager (Interfolio CSM). Click the 'Edit Pencil' on the new NSF Report template and navigate to the Synergistic Activities section to update the field. As with other Vitas, if the template is updated then all of the linked (by URL) vita will be updated as well. In addition to meeting the 2017 standards, we have updated the base functionality of the report. In this update, we've changed the way the "Synergistic Activities" section works. It used to automatically pull in activities that were tagged with the "Synergistic Activities" activity classification. We had received complaints about this because it's somewhat laborious and the formatting was sometimes messy or incomplete, especially when trying to display text boxes. 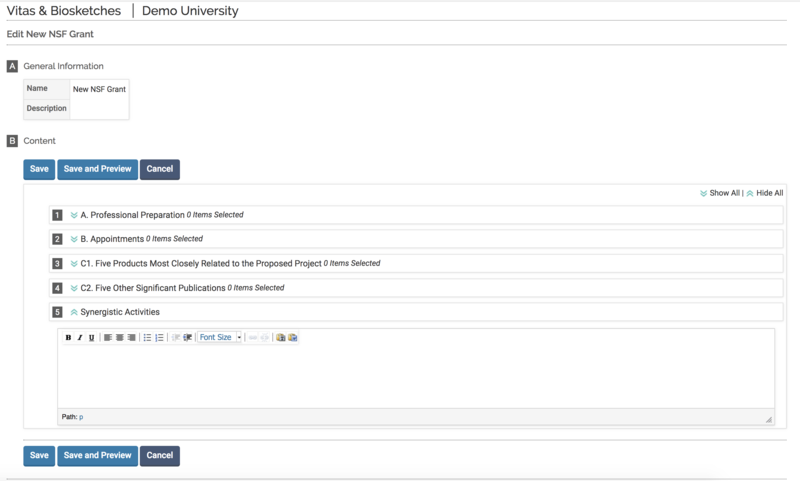 In the spirit of making the biosketch more configurable and easier to use we're going to make the Synergistic Activities section just an open Rich Text field (text box) that faculty can populate as they please. This makes the biosketches much more customizable and individualized for faculty; it also keeps faculty from having to remember to assign the Synergistic Activities activity classification to individual activities to get them to show up. We've fixed a bug related to the search bar being missing after navigating to the emulation screen by way of Quicklinks.